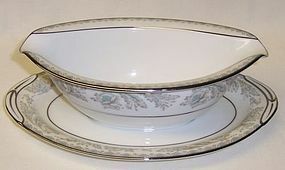 This really nice Currier and Ives Early Winter 8 1/2 Inch Rim Soup Bowl was made by Royal China. This Bowl measures 1 1/2 inches high and is in very good condition with no chips, cracks or scratches. 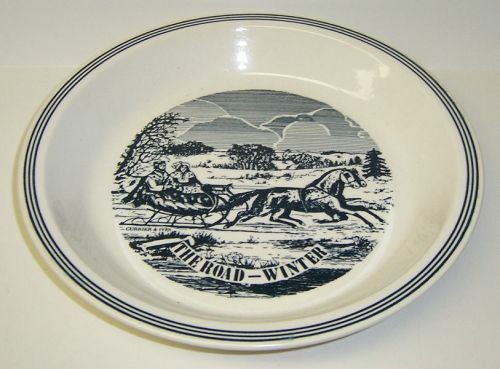 It is signed CURRIER and IVES - Early Winter - UNDERGLAZE PRINT by Royal MADE IN U.S.A. We guarantee items to be as described. THANK YOU. 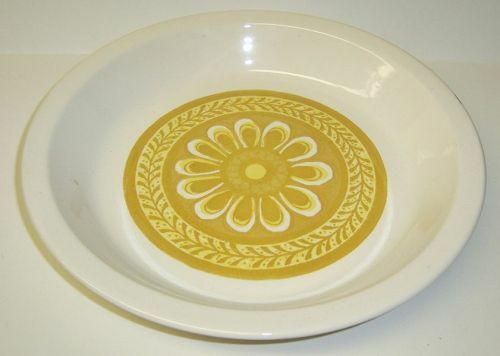 This is a really nice Casablanca 10 inch diameter Pie Plate or Pie Baker made by Royal China USA. This Pie Plate measures 1 1/2 inches high and is stamped USA on the back. It is in very good condition with no chips or cracks. Be sure to search our other Royal China available. We guarantee items to be as described. THANK YOU. This really nice Currier and Ives Maple Sugaring 9 Inch Round Serving Bowl was made by Royal China. This Bowl measures 2 inches high and is in very good condition with no chips, cracks or scratches. It is not signed. We guarantee items to be as described. THANK YOU. 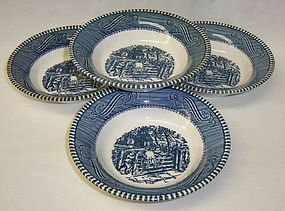 These four really nice Currier and Ives Old Farm Gate 5 5/8 inch diameter Fruit or Berry Bowls were made by Royal China. They each measure 1 1/4 inches high. All four bowls are in very good condition with no chips, cracks or scratches. They are not signed on the back. We guarantee items to be as described. THANK YOU. This really nice Vanity Fair 10 1/2 Inch diameter Dinner Plate was made by Royal Doulton. This Plate is in very good condition with no chips or cracks. It is signed on the back MADE IN ENGLAND - ROYAL DOULTON - ENGLAND - EnglishTranslucent CHINA - VANITY FAIR - T.C. 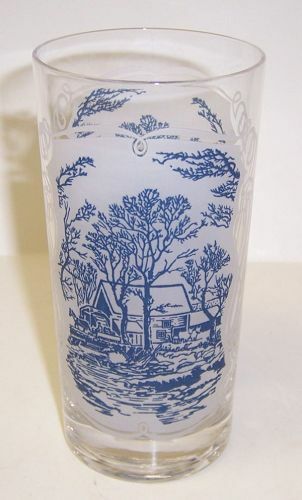 1043 - Copy Right - Doulton & Co. Limited. 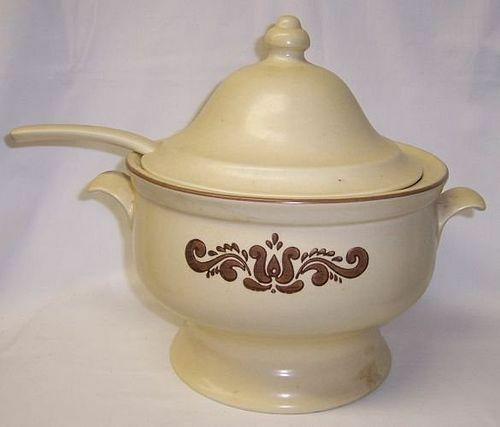 Be sure to search our other Royal Doulton available. We guarantee all items to be as described. Feel free to email any questions. THANK YOU. 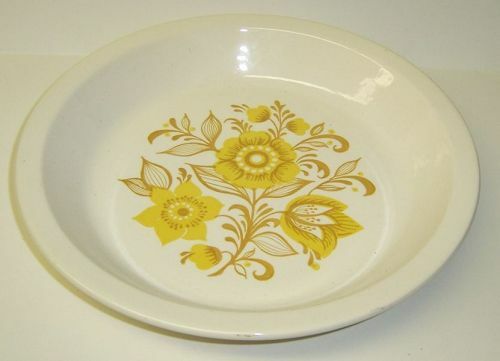 This is a really nice brown transfer ware Clarice Cliff Tonquin 7 3/4 Inch diameter X 1 1/4 inch high Low or Flat Soup Bowl made by Royal Staffordshire. 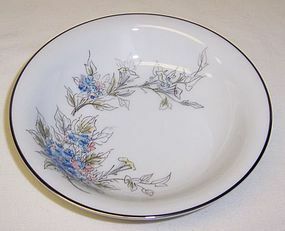 The Bowl is signed TONQUIN - Royal Staffordshire Dinnerware by Clarice Cliff - MADE IN ENGLAND. The bowl is in very good with no chips, cracks or scratches. There is light crazing and a couple light surface scratches on the surface of the bowl. Not bad at all. We guarantee items to be as described. THANK YOU. This is a really nice pair of Summer Time pre-1960 Cloverleaf Salt and Pepper Shakers made by Royal Winton in England from 1932 to 1960. These shakers have cream background, floral decoration and gold trim. They are 2 1/4 inches tall with 9 holes in one shaker and 13 holes in the other (pepper and salt, respectively). They are both in very good condition with no chips or cracks. They do have the plugs in the bottom. We guarantee items to be as described. THANK YOU.